Designed and created by Autumn Aslakson of the Ann Arbor Potters Guild, this beautiful matcha bowl is a lovely interpretation of the traditional chawan. As part of our collection of American-made teaware, it embodies the spirit of the next generation of artisanal potters – form, function and convenience! With a shape and weight that is pleasing to the hand and mouth, this matcha bowl is not only perfect for preparing organic matcha, but is also dishwasher and microwave safe. All bowls have a smooth white interior glaze that provides the ideal backdrop for the bright green liquor of matcha, and an exterior glaze that gracefully wraps over the lip of the basin. Available in two distinct colors, Burnished Rust offers a smooth metallic, fiery exterior that contrasts nicely with the textured Raw Turquoise, reminiscent of its namesake. 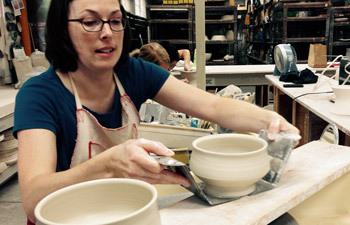 All glazes are non-toxic and lead-free. Please note: because each matcha bowl is individually handmade, variations in shape and color do occur and are celebrated! Available in burnished rust and raw turquoise.